theHotness | Thanks to Daddy, I’m Every Woman! Thanks to Daddy, I’m Every Woman! 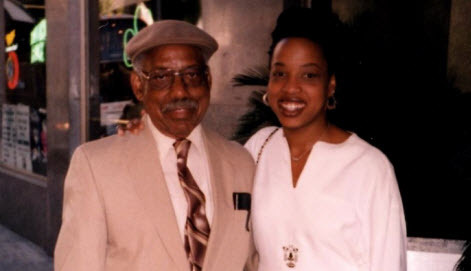 This Father’s Day was my fourth without my dad and to use Oprah’s phrase– What I know for sure— is that Daddy’s Girls never get over the loss of our fathers. I am always so full on Father’s Day. Not sad like that first Father’s Day when I decided to buy flowers to place on my dad’s gravesite. The woman behind the counter was busy helping one woman with her arrangement. She looked up and recognized me from around the way and asked, “So what are you getting your dad this year—a bouquet or a boutonniere?” I couldn’t hold my tears back and sobbed, “My dad died two months ago!” Everyone in the flower shop looked up and they all stopped what they were doing (customers and staff) and hugged me in a circle of love and support. That was a super tough Father’s Day to get through, but yesterday I had more of a nostalgic, spirit catching feeling rooted in the love and appreciation for all that my dad showed me and sacrificed for me. I am Kurt Moore’s daughter! I look like him, act like him and mostly, am a better woman cause of him. My daddy was an occupational therapist that used art to rehabilitate and ready veterans for the workforce and the stresses of life. His perspective on work and how you should feel about the work you do has a profound affect on my professional POV. I have never been motivated more by loot than by my passion when it comes to my career. He always said do what you love and you will have a good life. My dad was also a World War II Air Force bomber vet who hated to fly and never did after his service. It was too painful but that didn’t stop him. He had a silver gray Toronado that was as big as a Cessna and we would pack that ride up and head to Grandma Lula’s in Cleveland or to Canada to see Niagara Falls or to Aunt Thelma and Uncle Charles’ place in Baltimore. We got around. My dad was easy. He loved being a father to two girls. He rarely raised his voice and never spanked us. Instead he played us Donald Byrd jazz records, drove me to the #2 train in the morning and cooked dinner most nights when my mom took on a part-time job. He was the best example of manhood a girl could have. My dad truly made me the woman of my dreams. I didn’t want to blog about Father’s Day, but these last few days all I seem to think about is my daddy and it’s causing me to have major writer’s block. I don’t know why I didn’t want to write about my father. Well actually I do. There are a ton of reasons and the underlying theme is that it’s a personal thing. As many of you know my dad just transitioned last year and writing about it could be cathartic or it could be like scratching a newly formed scab. The not knowing has been reason enough, at least up to now, to keep my thoughts to myself. Well anyway every time I talk about my dad and how much I love him and why I credit him for most of my hotness folk say I should write about our relationship. So this is what I gots to say about me and my dad– Cornelius “Kurt” Moore. Because of him or should I say, road-trippin with him to Cleveland or Trenton in his silver gray Toronado Oldsmobile, I knew about green anti-freeze before I knew about Tampax Tampons. I could check the oil in his car long before I signed my first check. Hello Ms. Hotness. I’d like to share with you & your readers a book I purchased for one my friends who is a Dad raising a daughter for Fathers Day. I think this book makes presents your words in full color nicely. Absolutely beautiful…In honor of your daddy and all daddies on this special day.